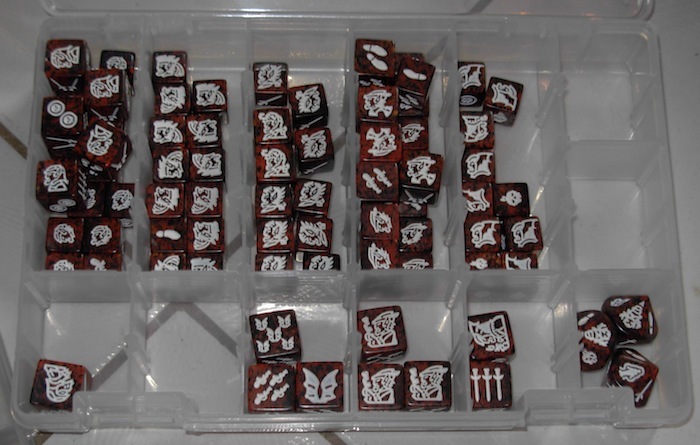 There were a few omissions in the first batch of Dragon Dice Shrinky Dink tokens. Overlooked making ones for all the Special Action Icons which generate lingering effects, and also the Wind Walk spell. Since the SAI effects target individual dice, they called for a square token — but special. Went back to the craft store and got a lever punch for a 3″ Scalloped Square. Good thing I peeked at the back of the punch and discovered that it was measured on the diagonal; which the way normal people measure squares, is really about 2-1/4″ across, a good match with the 2-3/8″ squares I’d cut for the spell tokens! 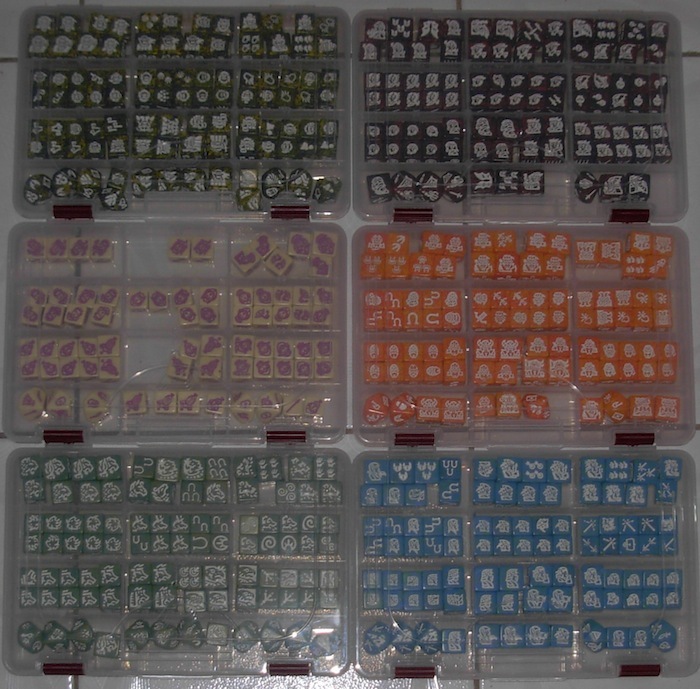 For the SAI tokens, I printed out the icons at a size to fit the plastic shapes. Traced them and coloured to match the colours of the race that has that SAI on it’s dice, or in the blended colours of 2 races that share one of the SAI’s. After shrinking this new batch down, I discovered that the colours are a lot more vibrant on the flip smooth side of the plastic than they are on the frosted rough side. The frosted rough side is the ideal surface for drawing on, and I hadn’t noticed this when I made the first big batch of spell tokens. The spell tokens will have to be used with the dull side up, I’m not re-lettering all of those. But for the SAI’s I can use the sparkly flip side. I did re-do the SFR Logo SAI (used for the Dragon Tamer die) with reverse lettering so that one can be used sparkly side up. 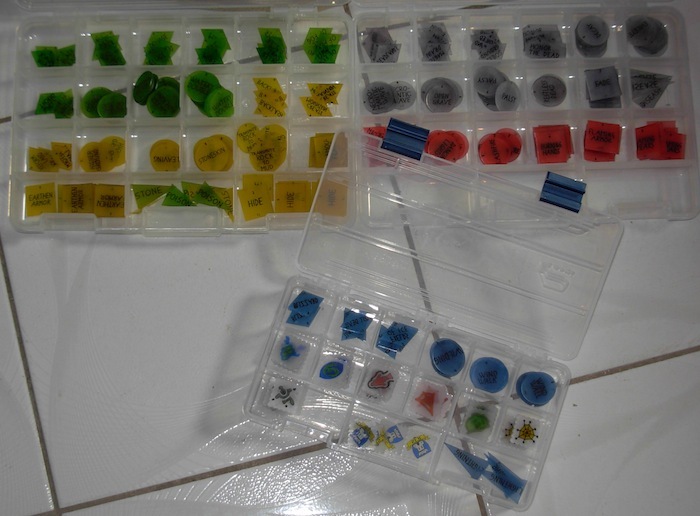 The addition of more tokens coincided with a general push to standardise my dice storage and transport systems. 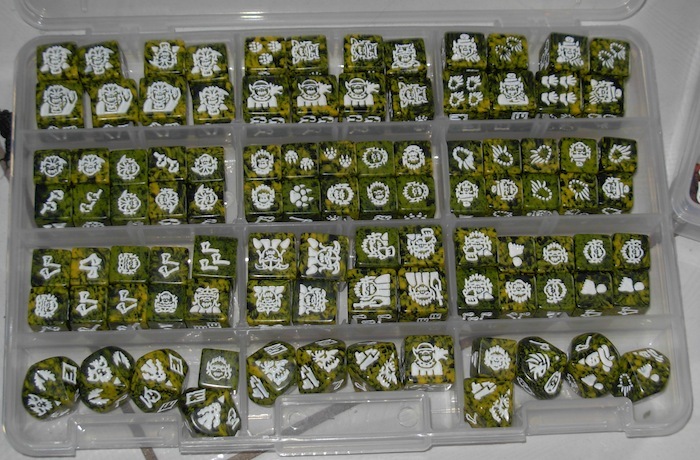 Up til now, I’ve kept my ready-armies in the old TSR dice pouches, and additional dice in larger pouches. Alas, the collection has grown too big for this system and it was time to break down for the more functional Plano option. The tokens now go into a pair of Plano 3601 and one 3500. The primary dice collections are now sorted into Plano boxes. The travel kit for each race goes into a thin Plano 3601. The way I’ve loaded these, 3 of the troop classes go into 2 compartments each with a carry load of 3 Large, 5 Medium, and 10 Small dice. 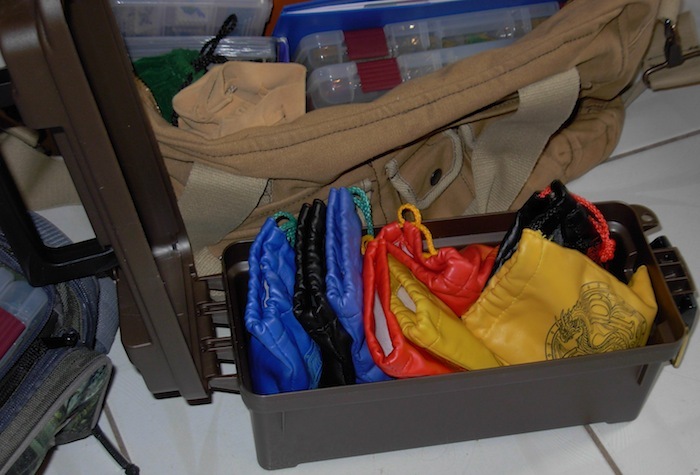 Then the other two classes go into 1.5 compartments each with 2 Large, 4 Medium, and 8 Small. Then there is room in the narrow compartments for an assortment of Monsters and a few additional preferred dice. A fully loaded 3601 weighs in at 2 pounds, like these Goblins here. For general travel to game nights at the local store, I carry everything in a heavy duty Rothco shoulder bag I got at the Army Navy store. 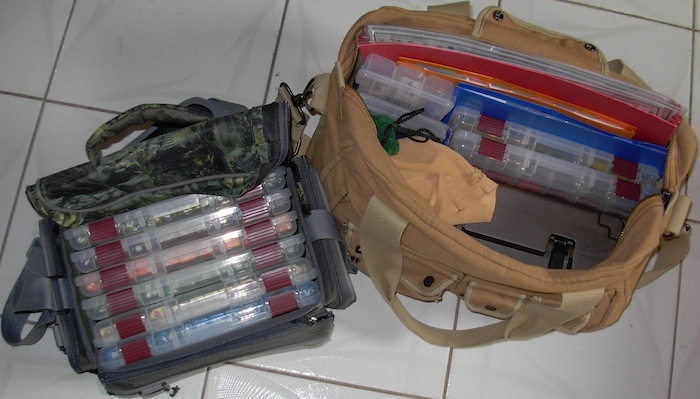 This is long enough to hold Legal-sized file folders with my playmats in tham, the rules binder, token boxes, ammo box, a few more larger pouches (one with terrains and dragons, and one with a larger ready-army). Then on top of everything there’s room for some snacks, and either one of the 3601 dice boxes or else some other game bits (like My Little Pony card game decks ^,^).